I frequently urge people not to focus on the value of the arts in terms of economic impact on the community. 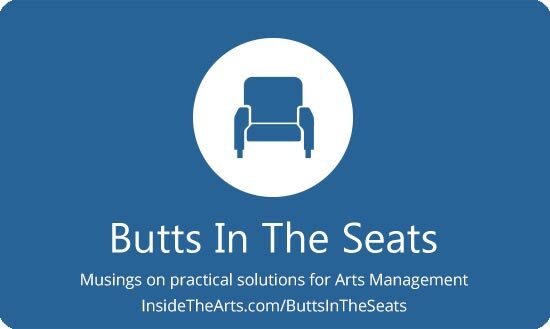 Not only do the arts bring other forms of value to the community, but what is frequently un(der)mentioned is that the community provides reciprocal value to the arts organization. We had the tour of a Broadway show come through a couple weeks ago. I was speaking with a local store owner who I know is a big fan of Broadway musicals and had attended the show. He mentioned that a number of cast members had come into his store and he had been thrilled to engage in some pretty lengthy conversations with them. In fact, on the return visit of one person, the shop owner almost inadvertently revealed the purchase of a Valentine’s Day gift in front of the customer’s wife who was accompanying him at the time. The shop owner reveled in the experience of quickly changing what he was saying mid-sentence and sharing a knowing look with the husband. The shop owner had mentioned local attractions, including a national monument, which the visitors were excited to learn about. Based on this anecdote, I figured there must have been numerous other interactions with individuals and businesses throughout town and posted a general thank you on social media to everyone in the community who had shown the cast and crew kindness and hospitality during their visit. I mentioned the shop owner had directed some people to the national monument and tagged both the shop and the monument. At the very least, I thought it was good PR to employ outwardly focused messaging. I didn’t necessarily think that the cast members had visited the monument. They apparently did and identified themselves (or were recognized) because the folks at the national monument replied about how nice the cast and crew members were and their interest in information about the monument. The shop owner also posted his delight upon learning they had taken him up on his suggestion. I have had similar experiences in other places I have worked. Local residents have been thrilled to have conversations in passing on the streets and coffee shops. I have had visiting artists express how friendly and helpful local residents were to them without knowing who they were. One of my most favorite stories is from when a flamenco group and the guest services manager of a hotel struck up such a strong friendship, the guest services manager went to visit them in Spain a few months later. I never had any problems with getting performers early check in for years after that so it was a big win for everyone. Bottom line though. As much as great events can bolster the reputation and appeal of your organization in the community, a good community can bolster the reputation and appeal of your organization among performers. A pleasant neighborhood with a wide choice of shops and restaurants isn’t just an asset to promote to attendees who want to grab something to eat before the show, visiting performers value those amenities as much, if not more. Don’t think word and personnel don’t circulated among artists. I was trying to describe our wardrobe facilities and green room to a company we had never worked with before in an email and one of the guys responded that he had been here before and sent pictures he had on file of our wardrobe facilities and green room. [Unbounce] then conducted two parallel surveys of consumers and marketers to understand their respective attitudes toward page speed. Nearly 75 percent of consumers surveyed said they’d wait four or more seconds for a mobile site to load. However, Google data show that most people abandon sites after three seconds if content hasn’t loaded. The majority of survey respondents indicated that slow-loading sites would negatively affect their willingness to buy and even return to the particular site. Surprisingly, women were more impatient than men in this regard. Interestingly a majority of consumers said they wanted faster-loading sites even it meant giving up animations, video and images. The good news for brands and publishers is that most consumers were more inclined to blame their ISP (50.5 percent) than the site itself (34.2 percent). Even though people were willing to blame their ISP over the site, that is no reason to think you can get by. Over 1/3 of respondents blamed the site itself. People are experienced enough to have a good sense where the blame lay. Among the top suggestions for solving this issue are optimizing image and video size; improving caching and hosting and running speed tests. If you are at a loss for where to even start to learn how to do these things–ArtsHacker has a whole series devoted to this. The impetus for this was anticipated slow downs due to net neutrality rulings by the FCC so there are a number of strategies in that series that you can use. You will definitely find pieces on image compression, speed tests, database optimization and minimizing the impact of page requests. Granted, some of these procedures should not be undertaken if you are inexperienced working under the hood of your website. By the same token, if you don’t know much about how website traffic works, the articles can give you new information and a better sense of what things contribute to slow downs on your website. Something I am curious about that is tangentially related is how quickly people will abandon a video if an ad they can’t quickly skip starts playing. This doesn’t usually impact videos embedded as performance samples in website that I have seen, but there have been a number of times I decided I wasn’t interested enough in a news piece to wait for an ad to finish. I suspect I am more patient with those ads than most so it makes me wonder about the long term viability of those ads. Especially as YouTube seems to be getting increasingly insistent in their offers to sign up for their paid service. I was excited to see Aubrey Bergauer posted a follow up to her original 2016 Orchestra X post regarding how the California Symphony was acting on the feedback it has received about the concert planning and attending experience. I have written about some of Aubrey’s work since then, but I was eager to see a cumulative reflection. Unfortunately, her post came in the middle of the holiday production crunch so I only got around to reading it this week. Another thing is that they started running digital ads in both English and Spanish. The Spanish ads have a link to a Spanish language landing page. That pilot test did lead to a measurable increase in Latinx households, and so we decided to put some money behind developing the new site in both languages. Now, when we run ads in Spanish, we can link to landing pages in the same language, another step in making this important segment in our community feel invited and welcome here, as well as give them the information they need to join us. This was not new information to me because Aubrey has been reporting her success attracting a broader audience segment on Twitter for a few weeks now. A lot of the work they did was in the area of providing background information both in their program book and website. Their program notes are more about the background of the artists and music than the technical details of the music. They have song clips and information drawn from Wikipedia available online for those who want to know more. They changed their writing style to short bullet points rather than paragraphs. Aubrey provides the rationale behind these changes based both in research and user feedback so it is definitely worth while to read this recent post.